The Premise: In The Big Leap, author Gay Hendricks explores how to conquer your hidden fear and take your life to the next level. The book explores the upper limits that we place on our potential and how to break through those self-imposed barriers. The book explores the concepts of how to prepare to make a big leap in your life – whether it’s around your personal life, career life, relationships – and then what you need to do to move beyond the upper limit barriers that are getting in your way. Hendricks focuses a lot of the book on how to identify and move towards what he terms your ‘zone of genius’: that skill and ability that you do better than anyone else. Peppered through the book are self-reflection questions that allow you to gain clarity on the areas that are being explored and stories of actual coaching clients are sprinkled through the chapters to further illustrate the points being made. Hendricks asserts that the only problem we need to solve in our lives is our individual ‘Upper Limit Problem.’ This ‘ULP’ is our universal human tendency to sabotage ourselves when we have exceeded the artificial upper limit that we have placed on our happiness, success, level of abundance etc. 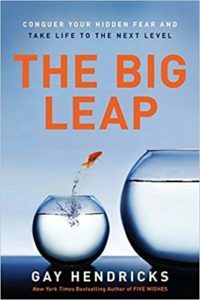 A quick read at 201 pages, The Big Leap provides some provocative ideas wrapped in with some solid tools for reflection to help you discover your own barriers and how to move beyond them. The Bottom Line: My biggest takeaway from The Big Leap was this concept of The Upper Limit. Have you ever noticed that when your life is going really well something not-so-great happens? Think about getting sick before delivering a presentation that you were really looking forward to delivering or having your computer crash on a report that’s due at the end of the day that you knew could easily finish but perhaps waited too long to get started on. How many times have you had an experience where, in hindsight, you look back and realize that you were potentially self-sabotaging? This is your Upper Limit in action. We all have our comfort zone when it comes to success. Even though we may set impressive goals or strive for bigger things for ourselves, once we start bumping up against the reality of breaking through to the next level, we subconsciously self-sabotage to keep ourselves down in our comfort zones. I lived the Upper Limit experience last year when I was nominated for a large award. One of the opportunities was to be videotaped as part of the awards program/event promotion. The night before my taping I had a spontaneous group gathering that lasted until 4 in the morning. Bleary-eyed, I headed to a 9 a.m. hair appointment and then a 12 p.m. shoot. Needless to say, I felt exhausted and not on my game. Why did I have people over knowing that this was happening the next day? For me, being nominated for that award had been a vision I had held for myself when I first started my business. Becoming a finalist threw me out of my comfort zone and suddenly into the arena of feeling like I actually ‘made it.’ Fortunately, I was able to recognize the pattern early and the rest of the awards process was more enjoyable. Since reading the book, I’ve also been thinking about how we have collective Upper Limits as teams. Right now our team at the Roundtable is working through our own collective ‘upper limits’ as we build our business to the next level. Bringing awareness to how you are hitting your upper limit allows you to become intentional with how you want to move through it. Recommendation: Highly recommended for leaders interested in increasing their self-insight and overall impact in all aspects of their lives.